Sounds like the 24 Hours of Lemons rules here - good stuff. Question 1: What if I want to build something in a pile of bikes that cost me over $100, but I have documentation to show that I sold off enough of the lot that my starting price is under $100? Would that suffice? Just considering the alternatives before jumping into the frying pan here - I just walked into four projects today (in a single lot) that could all fill the bill. I don't think I can swing a fifth, and I'm not really keen on riding the wheel-less Specialized RockHopper that a neighbor gave me (that'd be just way too easy - it's complete save for wheels, and the LBS gave me a pair of wheels that'd work - I'd have all but $5 in replacement spokes into the thing). Question 2: Is there a side category for overeager mechanics that can enter multiple sub-$100 bikes, and simultaneously disqualify themselves for not riding all the bikes 62 miles? Last edited by cudak888; 04-04-19 at 06:37 PM. Which one(ones) to choose?? I have been looking forward to this challenge for a while. I’ve gone through old PMs, and deleted Craigslist ads. Turns out that for my $100 purchase, I sold $130 worth of parts between last November, and March. That number reflects established value of parts sold after shipping costs. 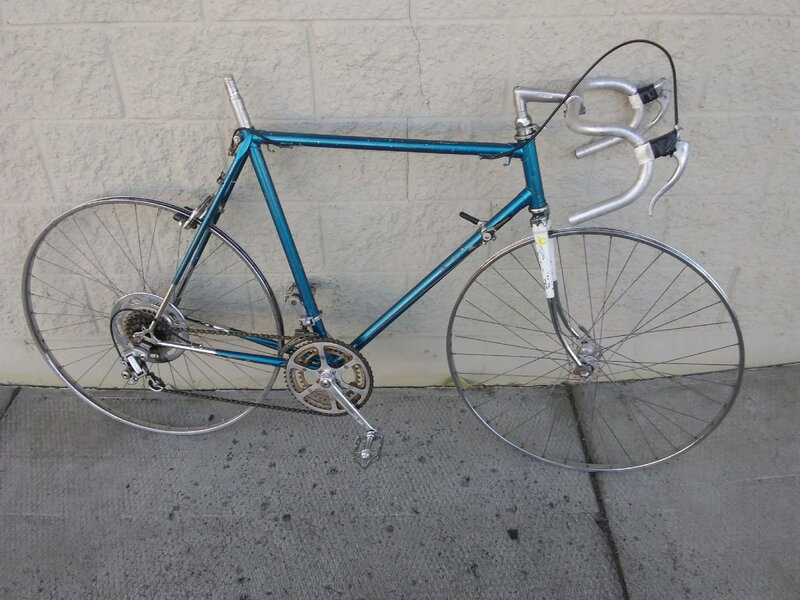 Selling both derailleurs, three chainrings, both hubs, both skewers, the freewheel, shift levers, brake levers, and a rear caliper, left me with a “free” frameset, stem, bars, and 30 bucks in the pocket. So, @Narhay last stipulation to work out here. Do I have what is a free bit of clunker material to work with? Or do I have clunker material AND a $30 credit towards the build? 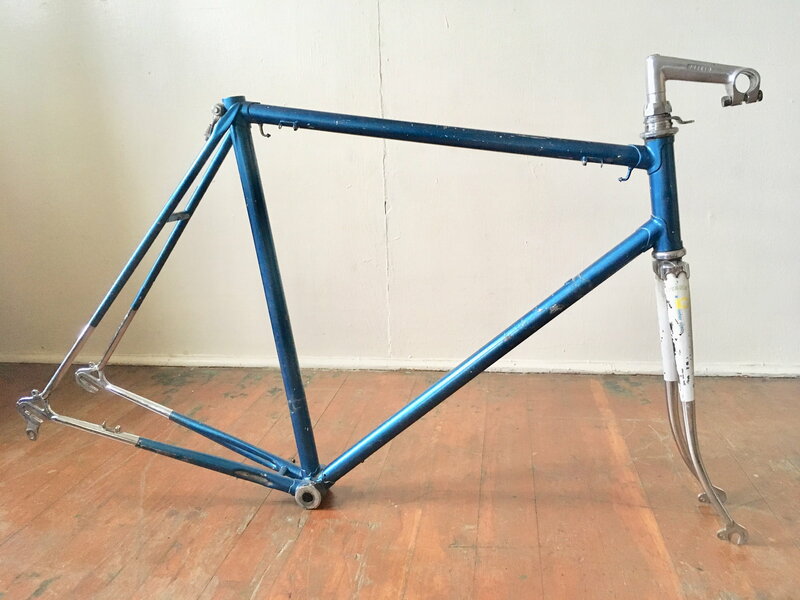 I have had a hankering, for no logical reason, to find an early 90's hybrid to build up as a bullet proof Commuter; Schwinn CrissCross, Specialized Cross roads,Trek multi track, Nishiki Ambush, Diamond back approach etc.. Steel, (some lugged) 700c wheels, slack angles, etc. Might try to find one for the challenge and then build it up after. I found a MTB in good shape for $80 last year which almost felt like cheating so I need to try something different this time. The idea is you make your $100 go as far as possible. If that means a free bike and another 30 to add to budget then so be it. Just because you are being clever with the budget doesn't require penalization. Do it. All the reasons are logical. Still waiting for @Narhay to specify the "exact" ending date/time. There is no age limit, just a price limit. Read the "rules". RobbieTunes: You come across some strange stuff, Jon. No, I'm sorry, "28's and fenders" won't fit. Update: The Jeunet is still there at the co-op, and I had the wisdom to put a 'save' tag on it. I looked it over and the bike is literally almost 100% steel. The handlebars, the seatpost, the wheels, the cranks, etc. I think the only aluminum bit s were brakes, levers, and maybe (?) 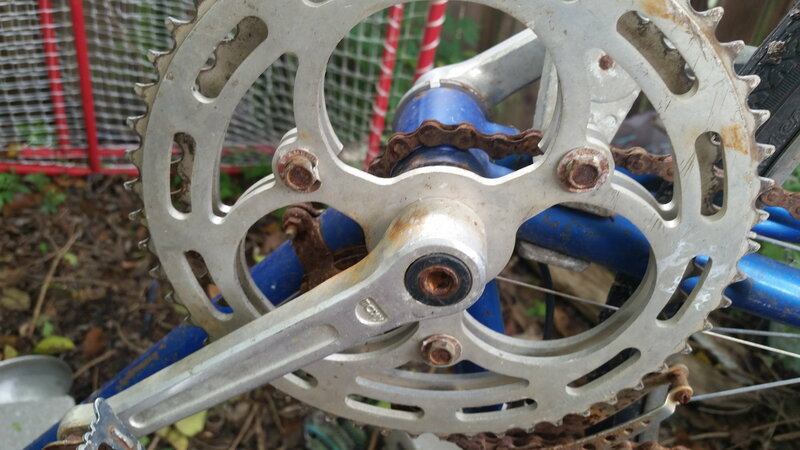 chainrings. The bike was in the 'strip' pile, which didn't make any sense. 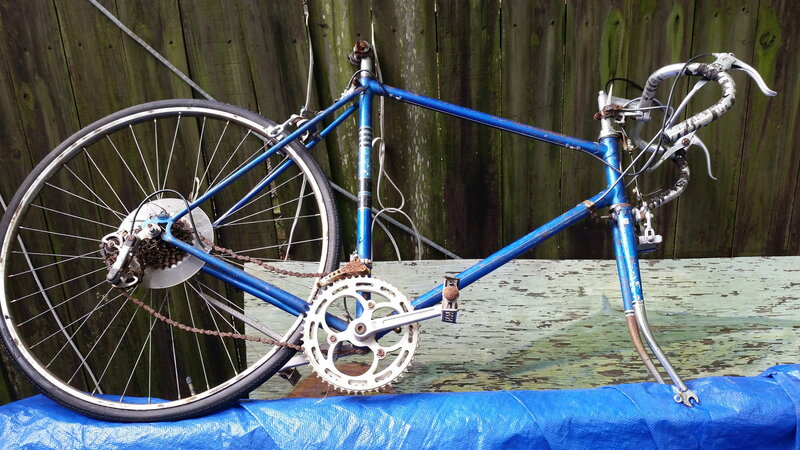 All the parts that could be stripped wouldn't really fit on anything else except an old french bike, which sort of defeats the purpose, and the rest of the parts wouldn't be worth saving anyway. 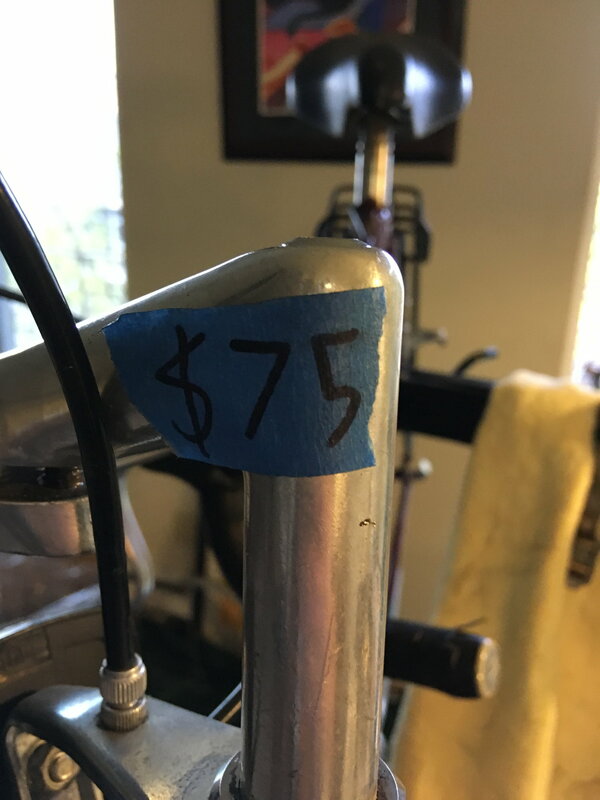 So, If I remove a rear wheel worth $25, and replace it with one worth $75, that's been in the shed for a few years, can I claim a "cost" of $50 ? I ought to able to make something out of this, right? I actually rescued this bike from a junk heap five years ago, fixed it up, and sold it to a (different) friend... who rode it into the ground and then left it to rot in a back yard for four years. My plan: Keep the drops, remove the rear wheel and drivetrain, add 7x3 indexed shifting in the form of OEM Shimano bar top "butterfly" shifters, and spread the rear triangle to 135 so I can wedge in some mismatched 700c hybrid wheels. I have a nicer frame I plan to cold set so this one will be practice. Then I'm gonna put a rack and a basket on and ride to Mississippi. Looking at the bike, I think the brake pads might not have enough adjustment to reach 700c rims. So maybe I'll be making some drop bolts. I'll post in progress pictures as I work on it, but I have to clear out a couple other beaters first! I anticipate swift progress in May when I'm done with school. Oh yeah! come to Papa!! So here we are and after some brake adjustment some air in the tires a little saddle and stem adjust. And the addition of some no name pedals and a bottle cage - I figure 3 bucks for the lot out of my parts bin, I am $78 in and have done a 1 km shake down cruise. 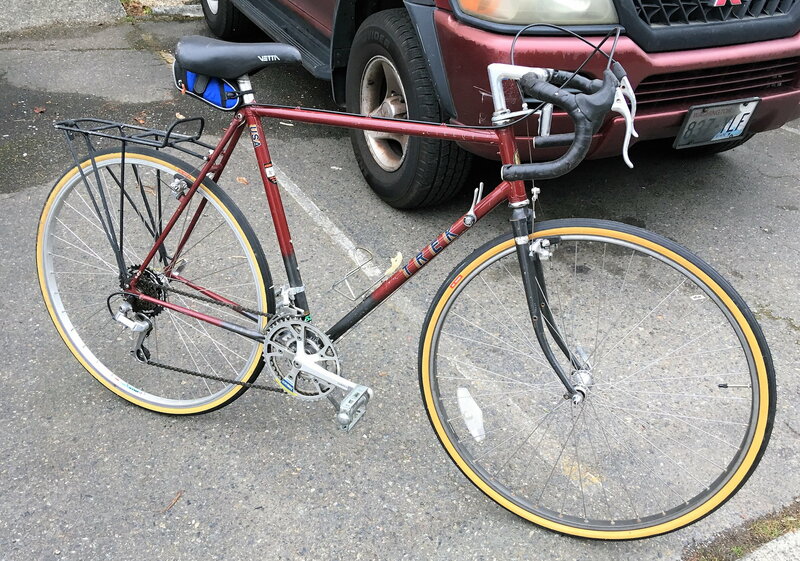 Aside from the replacement rear wheel and FW it all appears to be an otherwise Original 1987 Trek Cirrus 520. Clunker indeed - Pinch me. The SIS Indexing even works! Last edited by ryansu; 04-06-19 at 09:20 PM. What crankset is that, I have been looking for one like that for a while now. Took my potential clunker out for a shakedown cruise. After a two day WD40 soak, it broke down two times in the first 2K. Some good stuff in this thread already. 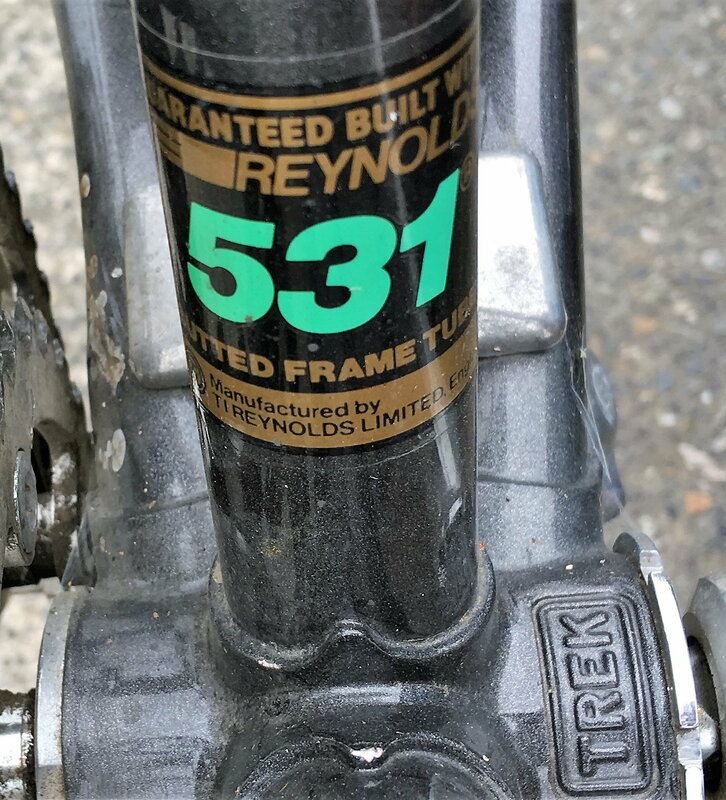 A Trek 520, and a Schwinn Cimarron. 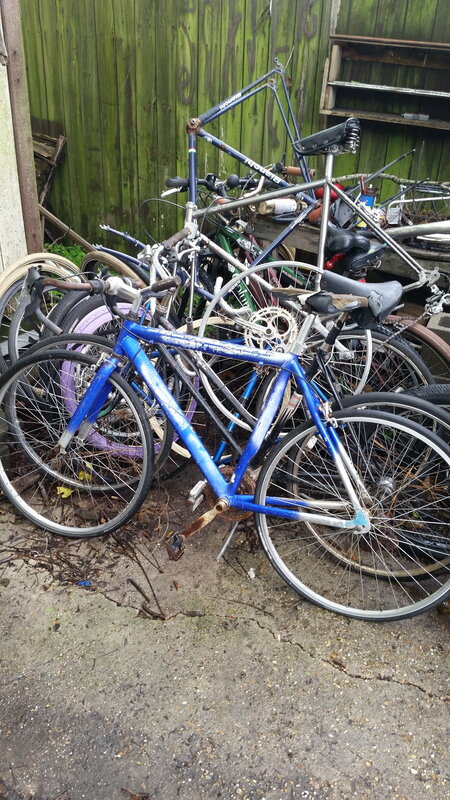 The Univega buried under Classtime's pile of free bikes is pretty decen too. I did one myself last fall and have about 1,000 miles on it and I’m very satisfied. Most people seem to be quite pleased with the conversion. Edit: had I been thriftier with my conversion, it would have come in under $100 total, I paid $25 for the bike, a 700 Multitrack. After some back and forth consideration, and checking in with the famed facilitator of challenged clunkers, I’m officially submitting, and committing. 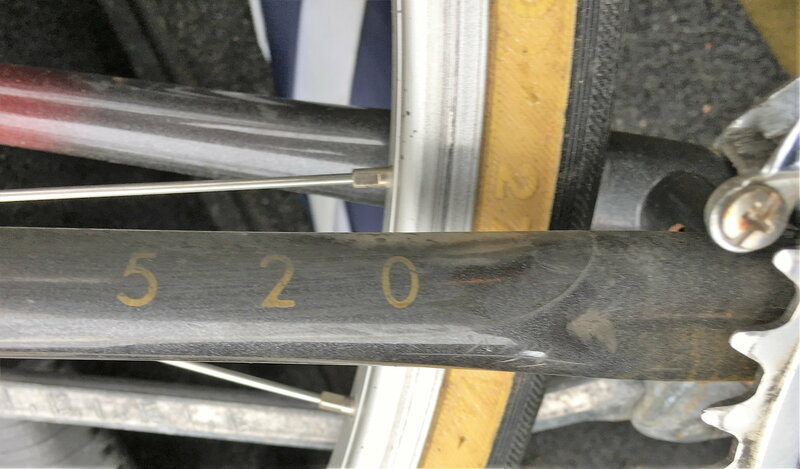 Actually the steel Regida noise maker rims were donated, but net profit from the sold parts is calculated at $130 resulting in a free frameset, and a budget credit of $30. We’ll see how it builds, but I’m thinking cheap, quick, and dirty is the way! Last edited by deux jambes; 04-07-19 at 01:42 PM. It's a Sugino Maxy. 54/47 chainrings, the big ring is swaged to the crankarm, and looking closely at it the driveside arm is 165mm and the NDS is 171. My current go to bike is my UO10. If I were to put it on craigslist, I'd be surprised if someone gave me a hundred bucks for it. less than a hundred total, for parts. I’m envious! The drop bar hybrid has hidden longings to be a 520 anyway, you’ve spared yourself much time and money for a superior product!